Last Thursday night I attended a VIP event at the newly launched MPW Steak House Bar and Grill in Windsor. 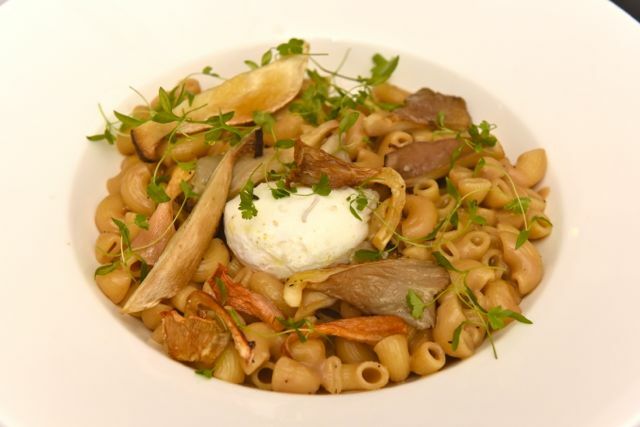 Situated inside the recently refurbished Castle Hotel Windsor, which is now part of the luxury M Gallery Collection of the Sofitel group, this latest addition to the Marco Pierre White family of restaurants is everything you might expect from the ever-expanding franchise. It’s a bit exciting to have an MPW restaurant open up in Windsor because while you might think a global tourist destination would have a number of high quality dining establishments, it is in reality, woefully devoid of any such place. People ask where they can get a good steak all the time. And to my tiny list of local restaurants, I think I could safely add the MPW Steakhouse in Windsor. The decor is luxe and conservative to match the newly revived hotel and probably not somewhere I would take my kids. 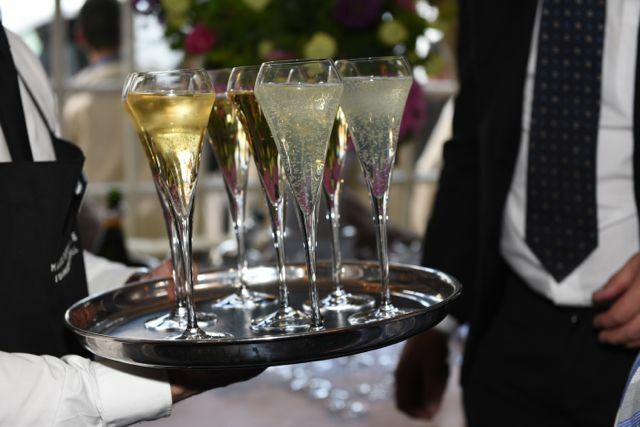 However, if I was looking for a smooth and sedate place to take my husband or some friends for a nice meal, I would absolutely choose the MPW Steakhouse. I’m not fussed on the idea of eating at hotel restaurants, but because the Castle Hotel is located directly opposite Windsor Castle and because MPW is a reputable brand, it feels somehow more accessible, more welcoming. Of course I had to order the steak. It came with onion rings and an absolutely knock-me-down-delicious tomato. The steak itself, was slightly more cooked than I wanted but the flavour and quality of the meat was excellent. My neighbour’s ‘rare’ rib eye looked much more to my liking. With so many factors at play, a perfectly cooked steak is a mercurial and wondrous event in itself. The star of the evening for me, aside from meeting MPW himself, was the dessert. We all agreed to order something different, so that we could try everything on the menu and lucky for me, it was my cheesecake that turned out to be the belle of the ball. A triangular slab of ultra-creamy, sweetness was in perfect counterpoint to the zesty-tang of the passionfruit coulis. We all agreed – it was the cheesecake that won the dessert wars. Generous portions, reasonable prices and excellent service amongst the spectacular setting of Windsor Castle, add to that the MPW reputation and a very enticing bar just beyond the foyer and by all accounts you’ve got the ingredients of the perfect night out. 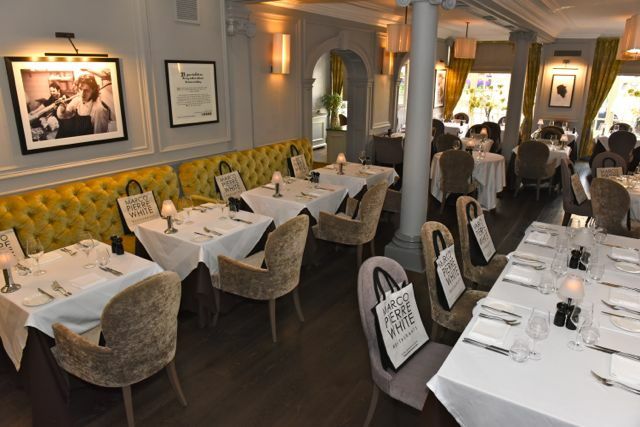 The MPW Steak House Bar and Grill is the place we’ve all been hoping would arrive in Windsor… somewhere to take your wife, your parents, your overseas visitors with the confidence that it won’t fail to impress. 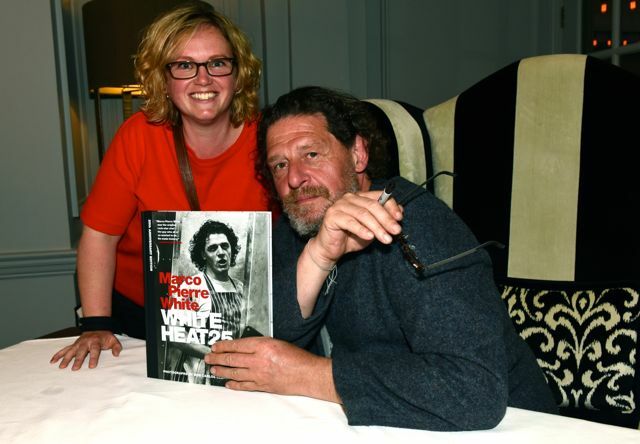 I got to meet MPW who was signing copies of his iconic White Heat book, this one a special 25 year anniversary release. My crazy-eyes give me away, but MPW remains as cool as ever and by golly, he’s still got it. 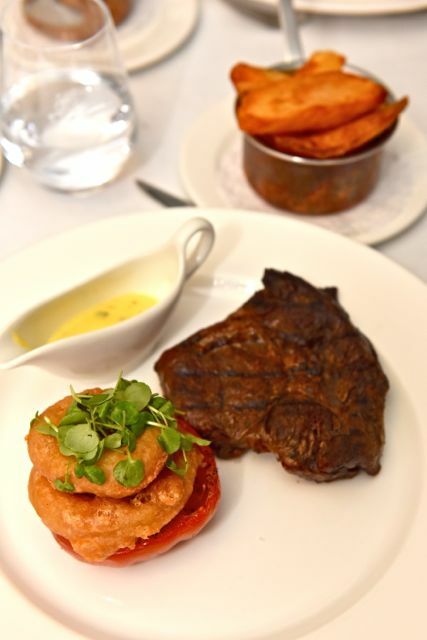 MPW Steak House Bar and Grill, 18 High St, Windsor, West Berkshire SL4 1LJ. Call 01753 641321 too book your table. I’d like to thank Ian Longthorne for these wonderful photographs of the night. Ian works with local and national media, his work appearing on major news sites and in publications across Britain.